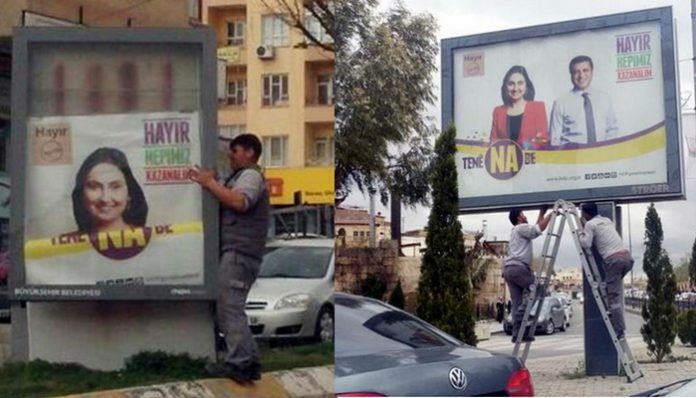 A court in Turkey’s Şanlıurfa province has banned pro-Kurdish Peoples’ Democratic Party (HDP) billboards prepared to promote a “no” campaign for a referendum to be held on April 16, CNNTürk reported on Saturday. According to the report, a photo of Figen Yüksekdağ, jailed co-chair of the HDP, was cited as the reason for the ban by the court. The HDP’s campaign song was composed by Kurdish singer Şeyda Perinçek and widely used by Kurdish politicians while campaigning to persuade people to vote “no” in a critical referendum on April 16 that will introduce an executive presidency in the country if approved. The Republican People’s Party (CHP) and pro-Kurdish HDP fear the reform will fuel authoritarianism. The reform will enable Erdoğan to appoint and dismiss government ministers, take back the leadership of the ruling party and govern until 2029. The plans foresee presidential and general elections in 2019, with a maximum of two five-year terms.